Back to my story. We started out at slack tide and did a little trolling over Hen and Chick and picked up one, then went drifting eels. It got a little chilly and I decided to put my pullover on. I got 2 arms in, and the fish hit. So there I am, in this straight-jacket, fighting this fish. Rick finally took pity and tried pulling the sweater over my head, which of course got caught in my glasses and stuck on my head, so now I'm blind and in a straight-jacket fighting the fish. 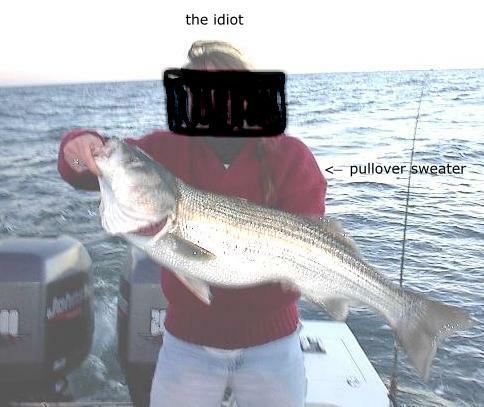 (If any of you were wondering who the idiot in the 25 foot Mako was, now you know.) Bottom line, I did get the fish in the boat. That's a picture of it, on the right. Later, I got a 37 incher. Ha-ha-ha. I let Rick catch the slot fish. We caught 9 in all. Kept having to throw them back because they were...get this...too big! What's up with that? 2 years ago, it seemed every fish was 27 1/2 inches and had to go back. I let Rick hold them. I covered my face to protect my "idiotness." Rick's been slaying 'em! Limited out every trip. They got 21 on Wednesday, 19 Thursday and 15 on Friday. In just a couple of hours, too. You can't keep that many, so it's hard to show in pictures. 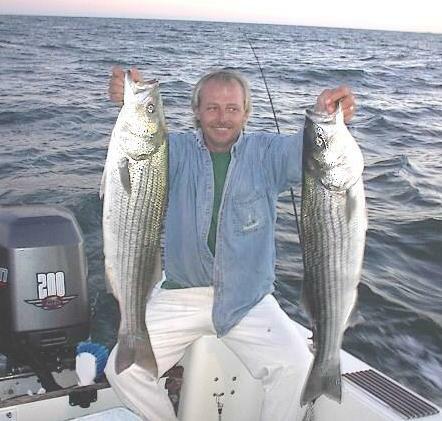 But fishing has been wonderful and should be good through Christmas. Our favorite way to eat them is smoked and cooked using the recipe below. Place fish filets in aluminum foil. Give them a heavy dose of soy sauce. Then sprinkle heavy with lemon pepper and minced garlic. Next comes a layer of mayonaise, about a half inch thick. (This along with the soy sauce makes a nice gravy.) Place a couple of sprigs of fresh rosemary on top. What comes next is up to you. Onions, tomatoes, maybe zuchinni, whatever you have on hand. Close foil tightly, cook about 45 minutes. It's easy, (no measuring) and killer. A huge hit at covered dish parties.